Lucky Danny: He said “See ya” and went off to live the dream by going on tour with his band Speaker Speaker. However, he’s redeemed himself (somewhat) by spying out some excellent sweets on the road. 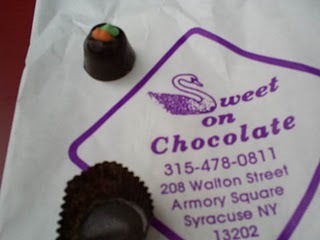 While we will be publishing a full update of what he ate on tour upon his return in November, one find was simply too good to wait: Pumpkin Truffles by Sweet On Chocolate in Syracuse, New York. Sweet On Chocolate has been making handmade chocolates since 1993, and features a wide variety of hand-dipped chocolates, hand-made truffles, and novelties such as dipped potato chips. While they say the latter is one of their bestsellers, at the moment of truth, Danny went for the pumpkin truffle, perhaps owing to the chill in the October air (or perhaps an employee’s suggestion). The choice was a good one: the dark chocolate shell broke open perfectly, and the consistency of the filling was a soft cascade of chocolatey-pumpkiny-carmelly goodness; an ideal mixture of sweet and savory, and deeply satisfying. Kind of like Halloween candy all grown up. Cakespy Note: Although it is not advertised, Sweet On Chocolate will ship orders pretty much nationwide via UPS; however, they will not ship during the warmer months or to warmer climates. Available at Sweet On Chocolate, 208 Walton Street, Syracuse; online at sweetonchocolate.com (splash page only). To inquire about having chocolates shipped, call (315) 478-0811.